Once I’ve made the first sketches and have some idea of how the design might look the next stage is make drawings with my model’s help and check out whether my ideas of pose are realistic and possible. I then scale-down these large studies and make tracings from the scale-down drawings. The purpose of all this is to discover a way to link the poses together to create an overall pattern. 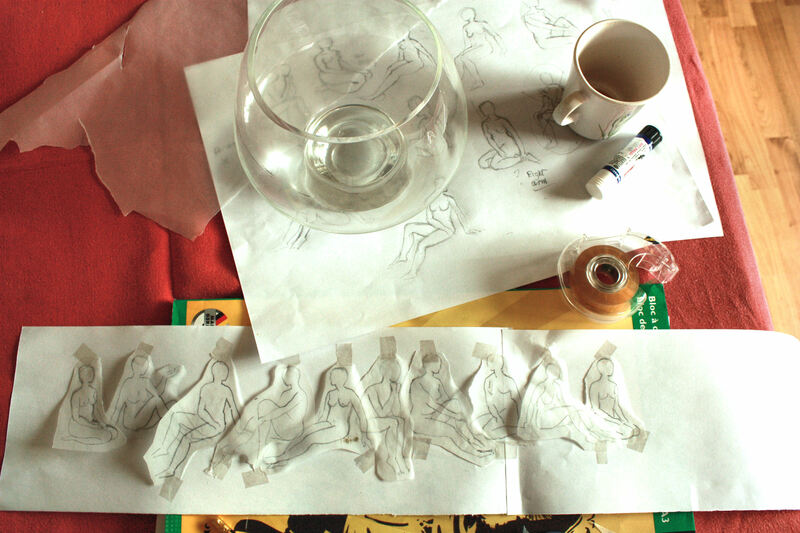 Having cut out all the traced figures individually I lay them out on a white piece of paper to see how they could relate to one another. It’s only then I have a notion of how it’s all going to look. If it doesn’t look too bad I can try this strip of paper round the bowl. (The way I am thinking at the moment is that the figures will encircle the bowl) If it’s too big or too small then that is bad news! Back to the drawing board!!. It’s a case now of assessing everything and deciding if if looks ok or do I need to make changes; replace some of the poses or do I need to start again??? ?.